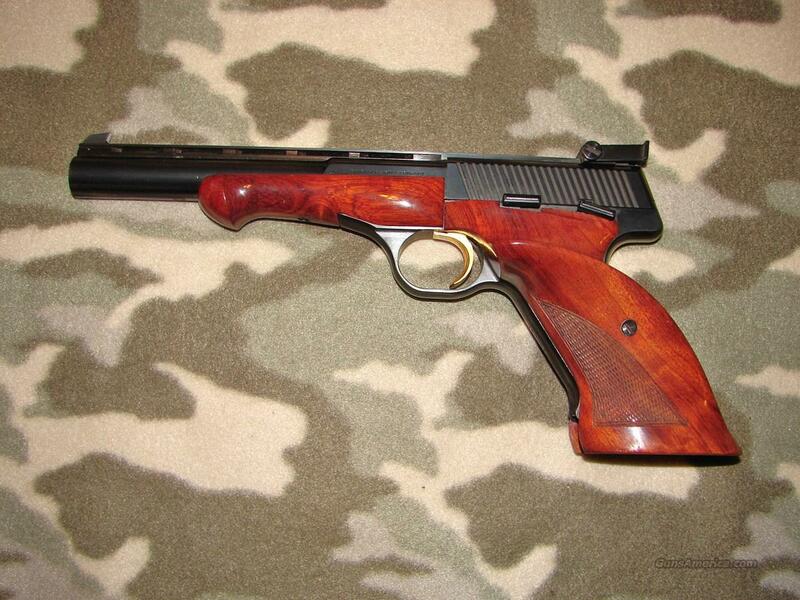 Description: Cased Browning Medalist semi-auto pistol serial #34825T3, 22 LR, 6 3/4” ventilated rib barrel with a bright excellent bore. The metal surfaces retain 99% original blue and the trigger has some lightly fading gold plate along the top edge. The oversized checkered walnut thumb rest grips and forend rate fine with a couple specks of flaking finish along the edges and a few light handling marks. The pistol includes a hinged leather case with ammo block, three barrel weights, turnscrew and a single magazine. The case has some light scuffs and spots of ingrained dirt in the red lining. A near excellent medalist pistol with accessories. Please note the third weight is holding the cover open.